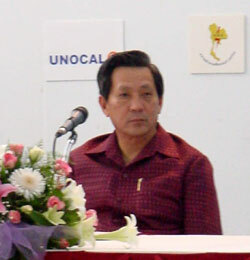 Pinij Jarusombat, the Minister of Science and Technology, presided over the exhibition’s opening ceremony. 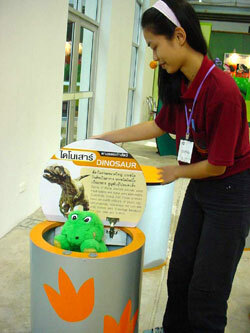 pretty young expert from CMU volunteers to explain crocodile footprints using an interactive media. The exhibition is in the series called “Natural ways: from the sea to Doi Suthep”, aiming to publicize the natural sciences of Doi Suthep Mountain and encourage people to preserve the environment and natural resources. The audience will see the history of Thai nature studies, and names of the plants and animals discovered (such as Mahidol fish and Rachinee crab). 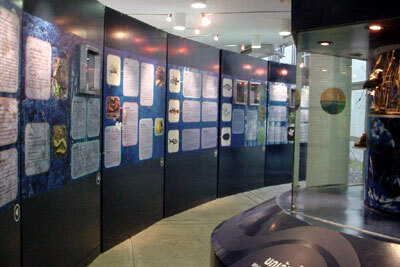 There is a display of Thai ecology and some kinds of forest animals and other creatures. 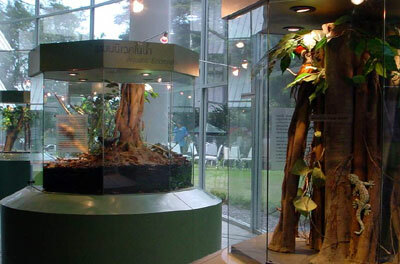 The artificial banyan tree was selected as an ecosystem case study. 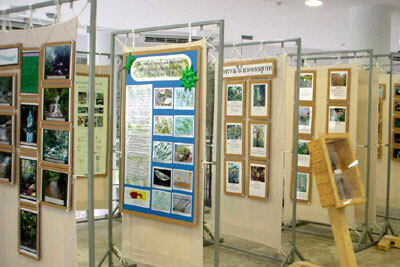 A part of the Doi Suthep Nature Exhibition. The information is interactive using computer media. There will also be an exhibition of the creatures on Doi Suthep, and photos taken from Doi Suthep. Inside the center, a beautifully arranged exhibition shows the history of Thai nature studies, names of plants and animals discovered and given the Royal Family’s name. The center is open daily (except Monday) from 10 a.m. - 5:30 p.m.
A Scottish family, led by their mother, Tracy Cosgrove came to provide clothes for HIV positive children at the Agape Home for Children in Nong Hoi, Chiang Mai on December 22. 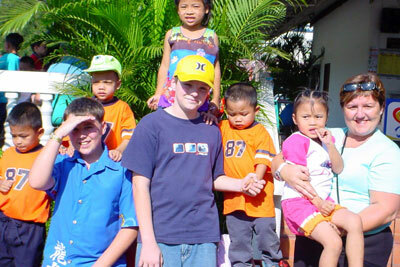 The Agape House is a home set up by Mom Avis Rideat for 33 HIV children who were from Phaya Thai hospitals, Wieng Ping House, and from their own families. 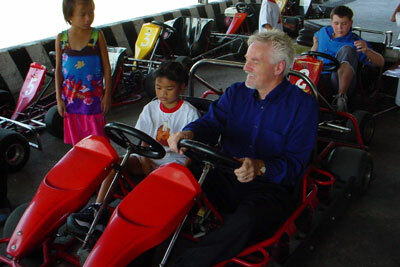 The Cosgrove group also took the children to Chiang Mai Speedway for a fun experience during the Christmas season. “Some of the children were a little scared, but the rest were very excited,” said Tracy. Tracy Cosgrove is a working mum from Scotland, has spent the recent 7 years of her life helping children in need around the world. 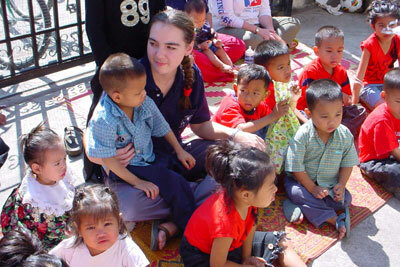 Traveling with her two children, Paul and Melissa, she also persuaded her own parents to come as well. She not only provided the children with 1,200 items of clothing and toys, but also offered loving care to all the children. “The delight in the children’s faces is wonderful. I myself am a widow of 5 years, and I know how hard it is for my children to only have one parent who loves them. It’s important for the children in Thailand. 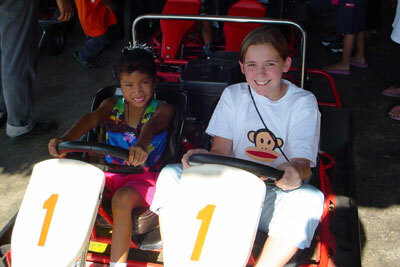 We help them to enjoy their childhood. If we can help, we will,” Tracy said. Tracy said that at the moment they have help of friends, and are sponsored by British Telecom Call Center Glasgow, the Glasgow Chinese School and Chinese ladies also helped pay for some of the clothes and toys. Tracy also thanks Thai Airways for the excess luggage allowance. Some may feel that with external influences and technology, the meticulous making of Thai crafts has been lost or forgotten in the rush to meet world market demands. Vision and tradition continue to be brilliantly blended in contemporary concepts at many Thai companies. The contemporary relies on traditional skills, while established skills are enhanced by modern interpretations. Access to some of the globe’s top designers and producers is at your doorstep. Lanna, Thailand’s northern region is celebrated for its fine handicrafts. Encompassing several wonderful provinces this mountainous region is literally heaping with endless, quality product selection. For extra special gifts, home and office decor, the list of places and variety of products is literally limitless. In and around the nation’s second largest city and old capitol of Lanna, Chiang Mai offers astounding shopping. To assist you in finding the ultimate treasures – a new magazine offers insight to some the best craft, antique, textile and furniture shops. In addition, it also includes manufacturers, exporters and special places such as exotic spas and special classes in the art of creating Thai cuisine. Abstract patterns in contemporary versions of traditional silk radiate luxuriously. Impressively beyond the realm of existing historical motifs and colours, ‘matmii’ silk, for example, that had utilitarian uses in woman’s skirts (pha in) transcends its beauty into fashionable scarves, cushions, functional containers and clothing. Clay in twisted forms is evidence that a new wave of young trendy-thinking artisans is seeing a future – worldwide for their creations. Celadon glazes crackle atop colour combinations and forms appealing to all. Avid and authoritative antique collectors alike appreciate the secret selection that awaits them. Asian antiquities from Thailand, Laos, China, Myanmar, Cambodia, Vietnam and beyond usually are found in a more vast variety in northern Thailand. Rare and heritage art objects grace collectors’ cabinets globally. Laquerware objects, hand-spun and woven textiles, reposs้ silver, fanciful puppets and Buddha images are only a few of the unusual and vintage collectibles. Southern exposure while making some final selections for special New Year’s gifts, is a very nice thought indeed! Many quality shops and special places have sprouted up around Phuket Island in the last few years. Offering antiques, contemporary and traditional handicrafts, home decoration and gift items, you are sure to find something for everyone. If you do not know where to begin – Art & Culture – Phuket, the definitive guide to studios, shops and special places has been assisting visitors and residents with their shopping needs for nearly three years now. The fun is in the hunt. All great venture finding the perfect New Year purchases. What splendid alternatives – taking a northern mountain break while making selections directly from the artisans or relaxing beachside after browsing through a range of Asian traditional and contemporary goods in the many featured outlets. If you prefer Bangkok City shopping – look for the upcoming edition of Art & Culture – Bangkok. In the same styling and completing the series as the only national shopping guide, it too will include many interesting articles from art, craft and culture experts such as Lonely Planet Thailand author, Joe Cummings; Art & Crafts of Thailand and Lanna Style writer, William Warren; author of Andaman Style, Ping Amranand; and cultural advisor, Professor Paothong Thonchua. Look for it in mid 2003. Pick up your complimentary copies of Art & Culture – Lanna and Art & Culture – Phuket (and Beyond) at major hotels and outlets in Bangkok, Phuket and Lanna, Thai Airways and TAT offices internationally and many other outlets – or contact directly to the Art & Culture offices in Phuket or Chiang Mai. Thirty-six young Chiang Mai artists, with a near-equal balance of Westerners and Thais, are collaborating to write, produce, and perform a musical based on Thai folklore and Western mythology. “Watachakra - Ad Infinitum” weaves a mermaid, a young hunter, and an evil monkey in a plot of love and betrayal. With original music performed live, the show features singing, dancing, video effects, and elaborate costumes. The piece is in English, with Thai subtitles projected on a screen. Co-director Laura Spector and actor Chadwick Gray, New York artists turned expats, felt their creative energy was underutilized in Chiang Mai. In October they held an open meeting for Western and Thai artists, and found that many “had a lot of artistic energy and nowhere to channel it,” Spector says. People from 13 countries brainstormed together and decided to put on a show, although they had no script, no budget and a tight time schedule. 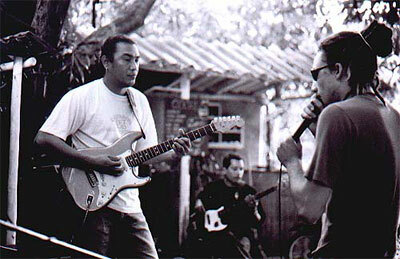 Writers hammered out a script as musicians held jam sessions at the Rasta Cafe. Local actors responded to an open casting call. The piece is currently in rehearsals, and will be performed January 9-12 at CMU Art Museum Theater. The group chose to work on a play “because we could integrate every art form we had available: music, drama, visual arts, dance, animation, sets, and costuming.” A seven-piece live band mixes ancient Thai instruments with bamboo sax, djambe, piano, and bass guitar. The musical style ranges from classical opera through rock and hip-hop. All songs are old Thai lullabies, sung in Thai to original music. Maew Vangchuay, co-director, wasn’t impressed at the first meeting she went to. “There was only one other Thai person there besides myself. But I thought I could help, because I speak English well and I could bring more Thai people into the production.” Maew, who studied drama at CMU, recommended herself as co-director. 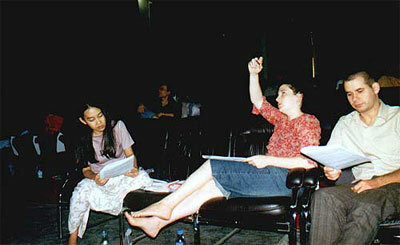 “I’m trying to make the play suitable for a Thai audience,” she says, in ways such as toning down the sexual innuendo. Canadian co-writer Ryan Harper says the play “is a caution about cultures misunderstanding each other.” The central drama is a war between humans and gods, loosely analogous to the conflict between Western materialism vs. Eastern spirituality. “The story is a cycle,” Harper explains. “The narrator is the ghost of the main character, the hunter. Mankind springs forth from a gourd, and then returns to the gourd in the end.” In the play’s title, “Watachakra” is Sanskrit for “cycle,” and “Ad infinitum” is its Latin counterpart. Funding has been a challenge. Armed with a letter of support from the American Consulate, committee members approached both Thai and farang local businesses asking for sponsorship. Most Thai businesses balked at the request, saying it was “too expensive.” “They’re probably not used to solicitations like this,” Maew says. “Chiang Mai needs examples of art patrons in our community.” As of press time, all of the play’s sponsorship is from farang businesses, such as Dasy Nails and La Gondola Restaurant, which generously funded the costumes. However, the directors decided on a very tight production schedule because in such a transient community, Spector was afraid that people would move away or lose interest if the timeframe were longer. Most collaborators are in their 20s and 30s. Actors range in age from 6 to 54. Many of those involved have multiple roles, such as Bpou Pawarakun, who solicits sponsors, makes costumes, and performs as a witch doctor in the play. The most difficult thing for him about his first acting role? Saying the “th-” sound properly in the word “those,” he says. Other artists are very experienced, such as Chadwick Gray, but here have a chance to experiment with new media. “I’ve never done animation before, and it’s fascinating,” Gray says. 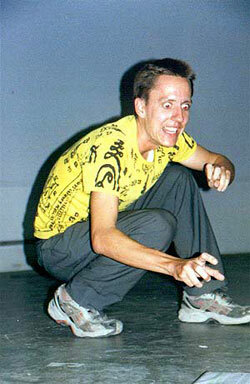 Gray is helping to create video and animation sequences, and plays the villain, the “demented monkey” Jaowanon. Chanida “Chompoo” Yasiri plays the mermaid who can’t be with her hunter lover because she is a god and he is a human. Chompoo, who studied acting at CMU, says her character is “loving, heroic, real.” Throughout the play she is fixed on a lotus flower, a choreographic challenge that means her acting has to be that much more dynamic. Admission is 60 baht general admission, 40 baht for students with valid ID.